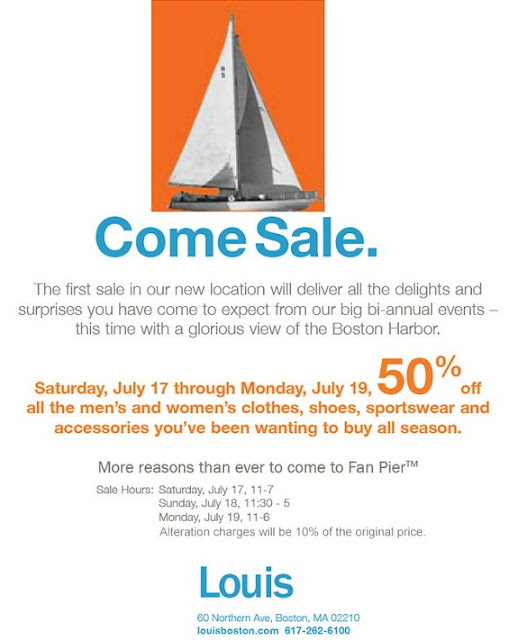 Perfect opportunity to check out the new Louis space on the waterfront. As long as this stubborn cold doesn't keep me down, I'm planning to tour the new location, grab some lunch at Sam's and sift through racks of the most beautiful clothes and shoes this city has to offer. On a related note, a few of you may have noticed that I haven't posted Weekend Happenings in a while. I've realized that most of my readers are not in Boston, and I'm wondering if Weekend Happenings is actually benefiting anyone. So, if you miss it, speak up! I so need to be near the waterfront of anywhere right now!!! It's insanely hot in Greece! Have a fab weekend sweet pea.